Final Cut Pro is a professional video editing application for MacOS users. The software gives powerful tools at the hands of editors to enable them to create stunning videos. These include filters, motion graphics, special effects and more. Final Cut Pro also supports 360-degree video editing for VR as well as real-time VR headset playback to see how the modifications work in their intended environment. 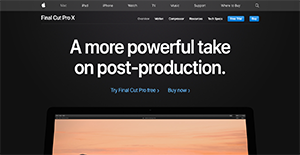 Moreover, Final Cut Pro is built on state-of-the-art computing architecture that allows it to leverage the powers of the latest CPUs and graphics processors that run on the latest Mac machines. This way, users can edit videos smoothly and speedily. Final Cut Pro provides professionals with the tools they require for avant-garde editing. These include the Magnetic Timeline that enables users to move and trim clips without causing problems for the rest of the video. These can even be color-coded to make identification of content easy and efficient. Additionally, editing is done smoothly because Final Cut Pro runs on a powerful architecture that allows video editors to handle heavy and complex projects and add more effects. The latest version of the application is also designed for the newest CPU and GPU that come with MacBooks to leverage their powerful performances. Final Cut Pro gives users the means to create spectacular VR videos for immersive experiences. The 360-degree viewer lets users see the video in all angles as well as enable them to make changes with simple tools. On top of that, the program also makes it effortless to apply graphics and effects such as texts and blurs. Final Cut Pro offers users the ability to carefully organize their assets such as video and audio. The application has a tagging ability for fast and easy pull-up of clip portions and entire clips. This way, users spend more time working on videos rather than searching for the assets they need. Final Cut Pro comes with motion graphics templates, video filters, and video effects that users can employ in enhancing their storytelling. These built-in features can even be expanded with third-party tools and templates for flexibility and control. There is no need for a separate audio editing program with Final Cut Pro. The software lets users modify their audio with built-in tools for removing background noise and optimizing sound levels. These allow for a more dynamic video with appropriate audio. Gone are the days of long rendering hours with Final Cut Pro, as the program makes use of multicore, multi-thread machines. By leveraging such processing power, it delivers complete videos in different formats at a faster rate for upload to video sharing channels, social media platform, and DVD and Blu-Ray discs. If you are interested in Final Cut Pro it may also be sensible to examine other subcategories of Best Video Editing Software collected in our database of SaaS software reviews. Since each company has particular business requirements, it is advisable for them to desist from searching for a one-size-fits-all perfect software system. Needless to say, it would be futile to try to find such a platform even among popular software solutions. The intelligent thing to do would be to catalog the various important elements that need consideration such as required features, finances, skill levels of staff members, company size etc. Then, you should do your research thoroughly. Read some Final Cut Pro reviews and check out each of the other solutions in your shortlist in detail. Such comprehensive homework can ensure you reject ill-fitting systems and select the solution that presents all the aspects you require for business success. How Much Does Final Cut Pro Cost? We realize that when you make a decision to buy Video Editing Software it’s important not only to see how experts evaluate it in their reviews, but also to find out if the real people and companies that buy it are actually satisfied with the product. That’s why we’ve created our behavior-based Customer Satisfaction Algorithm™ that gathers customer reviews, comments and Final Cut Pro reviews across a wide range of social media sites. The data is then presented in an easy to digest form showing how many people had positive and negative experience with Final Cut Pro. With that information at hand you should be equipped to make an informed buying decision that you won’t regret. What are Final Cut Pro pricing details? What integrations are available for Final Cut Pro? If you need more information about Final Cut Pro or you simply have a question let us know what you need and we’ll forward your request directly to the vendor.